WebFaction started its journey in 2006. Being registered in the UK, the company has several data centers in different parts of the world. It specializes in offering specialized hosting solutions for developers. 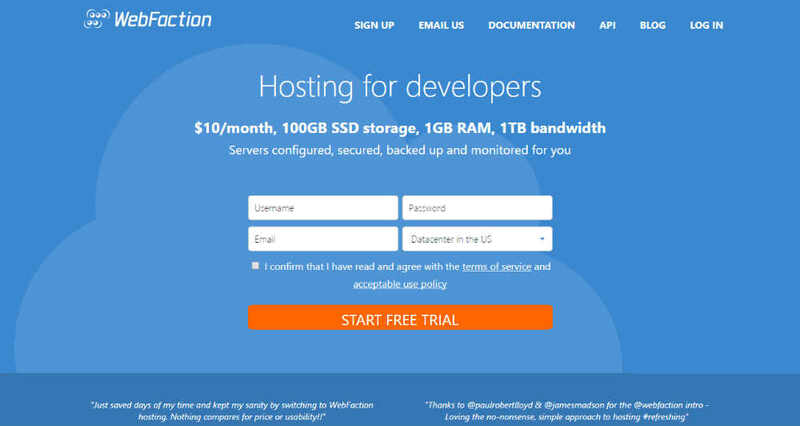 WebFaction is an exclusive hosting provider that offers hosting solutions designed primarily for programmers, developers, technicians, and the likes. The powerful server configuration and dedicated resource allocation will provide you with the raw power to host your new app or brand new website within a short period. The one-click installer will help you to get started with various CMS, forums, customer support, video sharing, and other tools. 60-day money back guarantee will come in handy to get your money back within the first two months. Shared: For $10 per month, this shared plan offers 100GB SSD storage, 1TB bandwidth, 1GB ram along with a shared multi-core CPU. 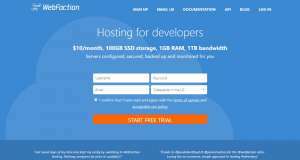 Cloud 2GB: For $20 per month, this cloud plan comes with 15GB SSD storage, 1.5TB bandwidth, 2GB ram, and 1 dedicated CPU core. Cloud 4GB: Priced at $30 per month, this cloud plan comes with 45GB SSD storage, 2TB bandwidth, 4GB ram, and 2 dedicated CPU cores. 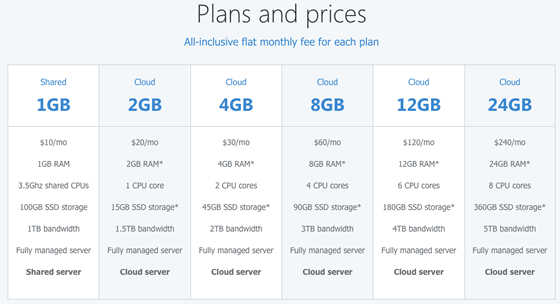 Cloud 8GB: At the cost of $60 per month, this plan includes 90GB SSD storage, 3TB bandwidth, 8GB ram accompanied by four dedicated CPU cores. 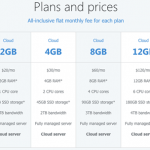 Cloud 12GB: Priced at $120 per month, this cloud plan offers a whopping 180GB SSD storage, 4TB bandwidth, 12GB ram along with six CPU cores. Cloud 24GB: For an eye-watering $240 per month, this mega-powerful plan puts 360GB SSD storage, 5TB bandwidth, 24GB ram and eight CPU cores at your service. The handy documentation and the Q&A community site will help you find answers to the common questions. The status blog will keep you updated about any existing issues. In case you need expert help, the support ticket system will come in handy for you. Monthly basis pricing start from $10 to $240. Features varies on the selected plan.